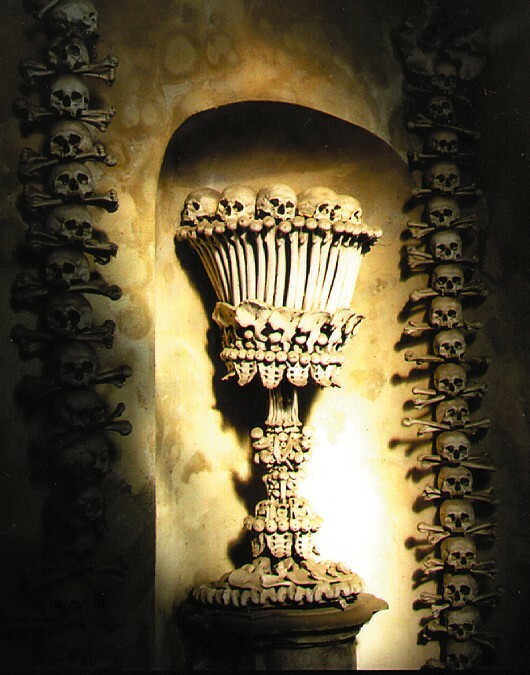 My photo of the bone chalice in Kutna Hora. Open: Daily November – February from 9 a.m. – 4 p.m. and April – September from 8 a.m. – 6 p.m. In October and March, it is open from 9 a.m. until 5. It’s closed Christmas Eve and Christmas Day. Admission: Adult admission is 60 CZK. Students are 40 CZK. When I visited, they asked an additional 30 kroner for a photo pass. English-language guidebooks were for sale, as well. The city of Kutná Hora lies only 70-odd kilometers outside Prague. It began as a small mining village. In the second half of the 13th century, villagers discovered rich veins of silver. The Czech king took over the mines and Kutná Hora (“mining mountain” in Czech) became the second most important town in Bohemia. The Prague groschen, a silver coin circulated throughout Europe, was minted here. By the 14th century, five or six tons of silver was extracted per year, making the Bohemian king the richest ruler in Central Europe. Eventually the silver veins tapped out and the mint closed in 1727. Since then, the town lapsed into being a peaceful backwater with some world-class medieval churches. From the bus station, follow the signs toward the kostnice, Czech for ossuary. It’s an easy kilometer-long walk, much faster than waiting for the local bus. The graveyard was sanctified in 1278, when Abbot Heidenreich brought a jar of dirt back from Golgotha, the hill outside Jerusalem on which Christ is said to have been crucified. With its handful of dirt, the little Cistercian graveyard became the most popular resting place in Central Europe. People literally came to Sedlec to die. Corpses got carted in from hundreds of miles away. Ten years later, 30,000 bodies — roughly the population of London at the time — had already been buried in the Sedlec graveyard. In 1318, the Black Death increased that number dramatically. At the close of the 14th century, the Cistercians built a small Gothic church in the middle of their immense graveyard. The Church of All Saints appears to be about the size of a modest two-story house with a crypt below its chapel. Because the graveyard was filling so quickly, the Cistercians decided to dig up the oldest bodies and store their bones inside the church, leaving the ground outside available for new burials. This sort of exhumation occurred commonly in Medieval Europe, since the Church proclaimed that, to have any hope of Heaven, the dead had to be buried in holy ground. With Papal permission, the ground part could be easily discarded. An ossuary in a church was still holy, even if the bones remained visible for all to see. In 1421, Protestant troops led by Jan Hus attacked Sedlec, martyred the monks, burned their cathedral nearby, and plundered the cemetery church. New monks arrived in 1454 to live in the monastic ruins, but the little church continued in a state near collapse until the Order saved the money to renovate in 1661. Another thorough restoration and reconstruction was completed in 1870, when Frantisek Rint — a woodcarver — rearranged the bones. Above the staircase to the crypt, the bone decor begins. A daisy chain of skulls, crossed bones wired beneath them, traces the arch. In alcoves on either side of the foyer stand chalices assembled from bones. Long bones from the arms form the bases, topped with a layer of shoulder blades. Then the lacy architecture of tailbones supports a complex arrangement of smaller bones: flat disks that might be kneecaps, the slender bones of forearms. The bells of the cups are shaped from thighbones and topped with skulls. It’s breathtaking. As cool as the inside of a refrigerator, the relatively dark chapel doesn’t smell of death, or rot, or even of mold. There isn’t a hint of corruption in the crypt. Despite the stained and crumbling plaster on the walls, the scent seems curiously neutral. Each corner of the crypt holds a huge pyramid of bones. With 40,000 skeletons, each with an excess of 200 bones, one might expect to see many objects arranged from bones. But this is not a catacomb in the Parisian sense, nor a labyrinth of tunnels full of bones stretching away underground. The Sedlec ossuary fills a small room. You could twirl around in the center of it and see the bones of all 40,000 people, most of them stacked in these four huge pyramids. Still, the pyramids are huge. Throughout the world, throughout history, pyramids have linked heaven and earth and symbolized earthly reality governed by heavenly order. Suspended above the pyramids hung tarnished silver crowns, signifying the promise of Heaven for those who’d died as Christians. An eight-armed chandelier of bones blossoms in the center of the room, as fragile and delicate as lace. Jawbones strung end-to-end form loops like links of chain. The gentle slats of shoulder blades fan out to form platters, which support skulls. The intricate architecture of tailbones provides a repeating motif. It doesn’t feel sacrilegious. In fact, the overwhelming mood of the place is contemplative. Below the chandelier rise four obelisks adorned with skulls and heavy silver sconces. Since ancient times, the obelisk has been considered the architectural materialization of a ray of light. It symbolizes the victory of light over darkness, the supremacy of God’s Heaven. Atop one of these obelisks hunkered a fat pink cherub with stubby gold wings. Its hyper-Romantic cuddliness disturbed me more than the bones did — it seemed so artificial and unnecessary, deeply out of place. Beyond the obelisks opens an alcove with a crucifix. The pallid Christ drooping there seems drained of blood. His head lolls forward, devoid of will. His mouth hangs slack. It dawned on me that this Christ was dead. He was the only flesh-clad cadaver in this cellar full of anonymous bones. However, the dead Christ wasn’t there to be worshipped. I saw no chairs in which to sit and pray, no cushion on which to kneel. The sense was not that the mystery had been performed, but that it was yet to come. All these Christians died with the certainty that they would wait until the Trump of Doom sounded before they being called into the presence of God and judged worthy to enter Heaven. The idea that Grandma waits for us in Heaven is a new one: prior to the 18th century, everyone went to the grave to rest until the end of time and the final judgment. The chandelier hangs maybe seven feet overhead: low enough that it seems you could jump up and make it swing. Candleholders perch atop the skulls, but no trace of wax mars their perfect round blankness. The Cadogan City Guide to Prague says that, until the 1990s, the church used to light candles in the chandelier on November 2, All Souls’ Day, the Day of the Dead. A priest used to intone the requiem mass inside the charnel house. Apparently, church officials decided that the masses were “out of step with modern Catholicism” and discontinued them. Services may still sometimes be held in the chapel. This entry was posted in Cemetery of the Week, Church burial and tagged bones, crypt, Czech cemeteries, Kutna Hora, ossuary. Bookmark the permalink.